A lot happened in 2017: I got a new job, bought my first house, my boyfriend, his daughter, and I moved in together, we got a chinchilla, and I de-mosquitoed our above-ground swimming pool. (There is hilarious footage of me with trash bags duct taped to my legs, wading into the water to drain it.) One thing that didn't happen....was blogging. So right off the bat, I am very skeptical about this flavor. 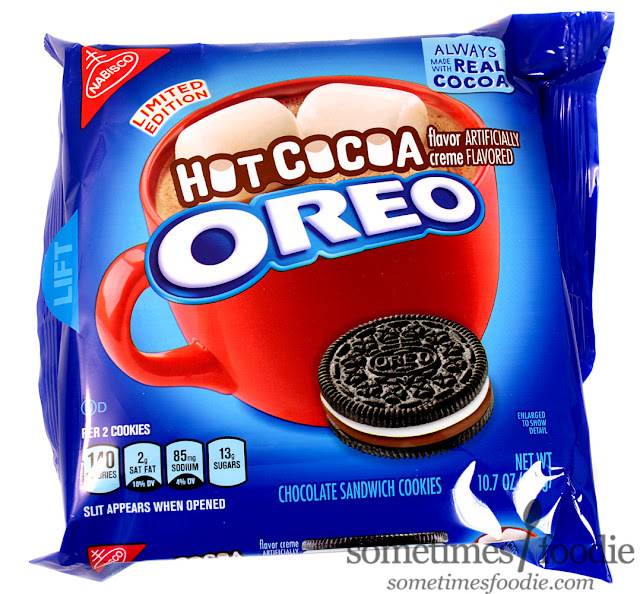 Hot cocoa is just chocolate milk (or chocolate-water) served hot with marshmallow, and a lot of food companies would simplify that into plain ol' chocolate and vanilla flavors...which is a normal as-is Oreo. 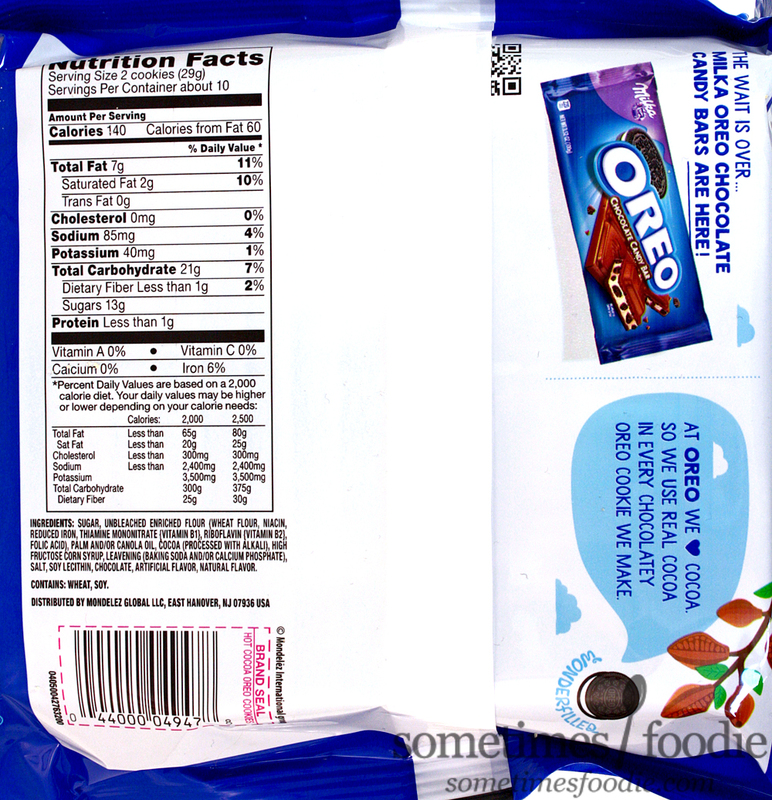 I'm going into this thinking it's a scam, but after several Oreo limited Edition flops, I'm pretty jaded. 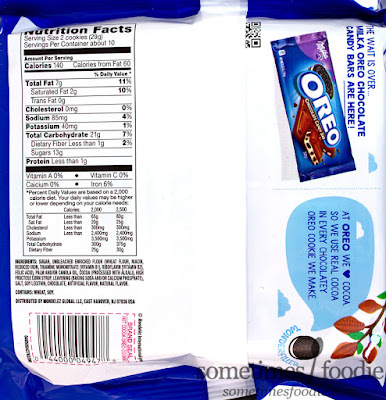 Once opened, the aroma is chocolatey and appealing, but not all that unique, it's really similar to the chocolate creme Oreos sold year-round, and all the other chocolate-themed flavors released in the past, like Brownie Batter or Mississippi Mud. Actually, come to think of it, this smells and looks a lot like Mississippi Mud. It's a chocolate cookie, and a two-toned chocolate-x-vanilla creme filling (this time layered instead of split down the middle.) Could this be a re-branding-re-release? The Mississipi Mud Oreos were Dollar General exclusive, and these were more widely available, so from a business perspective I wouldn't blame Oreo for trying to re-style some overstock for the Holidays, but as a foodie...I'd be pissed. Step one: Trying each of the creme fillings on their own. White Creme - Surprisingly milky! Okay, I might have been a little overly cautious. 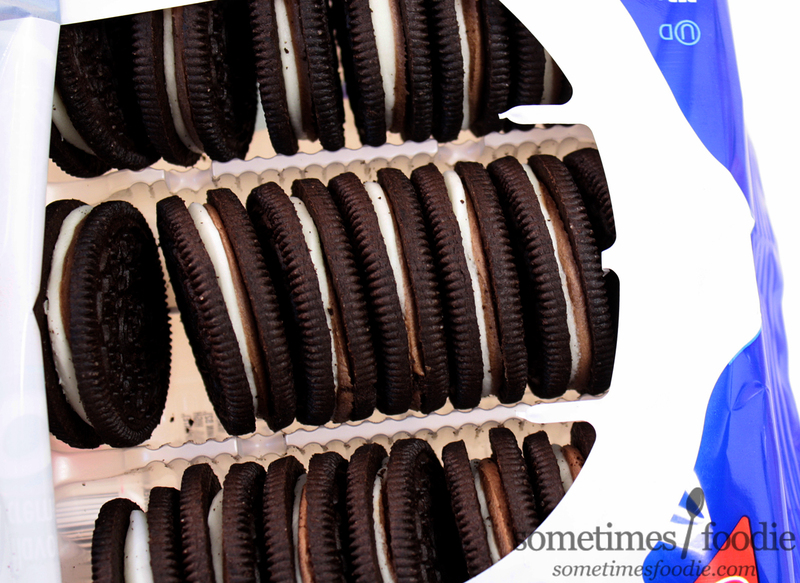 This white creme filling has creamy dairy notes that I don't find in normal Oreos, and it's noticeably less sweet. 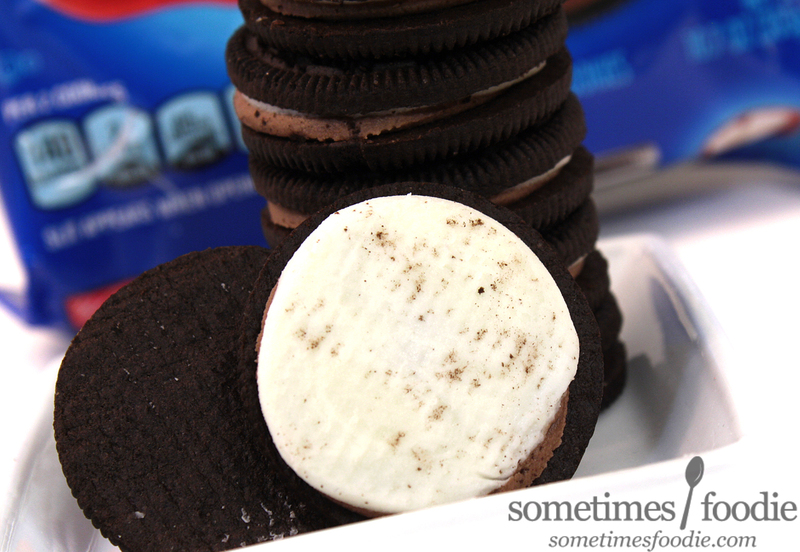 I'm not entirely convinced that this isn't the same white filling from the Mississippi Mud Oreos, but it IS different from normal Oreos, so it gets some credit for that. Filling Combined - I'm definitely getting Yoo-Hoo vibes from this filling. There's some creaminess, but it's oddly water-y. If you make your hot cocoa with water as the base (not milk) you could argue that this is pretty spot-on, and it's pretty enjoyable. I can't say with 100% confidence that this is a recycled Mississippi Mud Pie Oreo formula, but it's really similar. So much so that this doesn't feel like a new Oreo at all. Eaten with Cookie - When everything is combined, the cookie portion outshines the creme and anything new or interesting fades away into chocolate-cookie-oblivion. 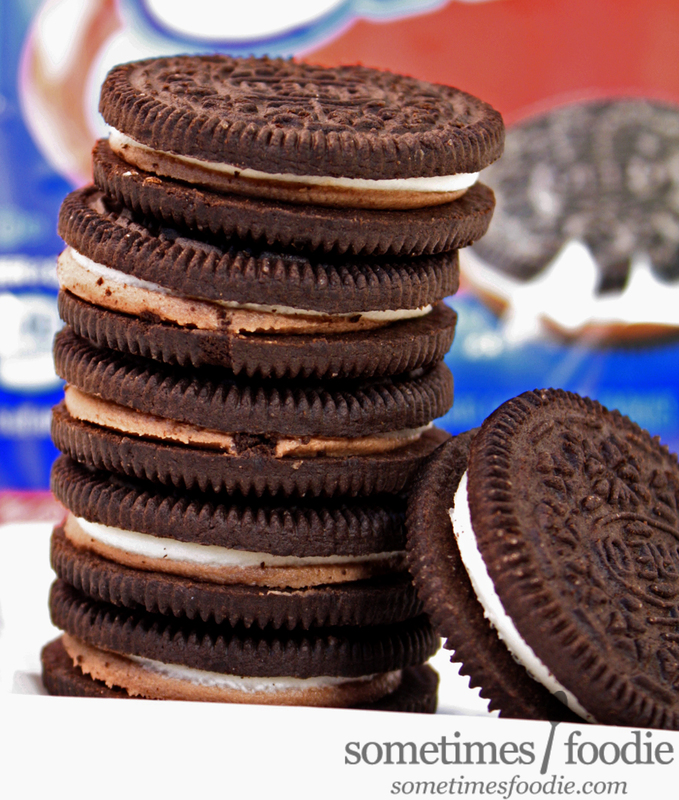 It's not a bad cookie by any means, if you like normal Oreos or their chocolate-creme version, this is a delicious cookie, it's just not special enough to be a limited release. Now a few years back, when I reviewed the Cinnamon Bun Oreos, a reader suggested I microwave them for a few seconds before eating and it completely won me over. Since Hot Cocoa is...well, hot, I decided to try that here and see if that changed anything for me. When Microwaved (for 30 seconds) - the filling gets softer, creamier, and the cookie warms up a bit, which does give me a slightly more hot cocoa-like experience. Overall, it feels like the creamy dairy-like white part of the cookie shines a bit more brightly through the cookie-base, and you know what? It made me like this cookie more. It didn't completely win me over and make me an instant fan of this cookie, or make me feel less ripped off as a foodie, but I will be eating the rest of the package this way, so if you do have these laying around, or you pick up a bag or two on holiday clearance, microwaving them is definitely the way to go. The general public will love this flavor, but new-food-seekers are going to be disappointed. My boyfriend's daughter ate one this morning and since she's used to the revolving door of fancy Oreos in our pantry, she was disappointed that this tasted, "Like a normal Oreo." This is not a new or original flavor, it's stuff we've had before in a new seasonal package. I'm not angry I bought these, because they are yummy, but I can't say I'd ever recommend them to anyone because they're so...forgettable. This is easily interchangeable with the normal chocolate-x-vanilla filled cookie available year round or Mississippi Mud Pie, but if you do have the chance to try them, pop 'em in the microwave, for sure. Keep Up with My Daily Adventures on Social Media!